We spend early summer afternoons on a blanket, books in hand, looking up at the green woven canopy with the sweet fragrance of roses tickling our noses. Beach sunsets follow, with a thousand orange and pink hues sinking into the sea at the horizon. In the fall, we slip on our gumboots to splash through puddles and trek through the muddy mulch trails lined with glistening green moss. When winter arrives, we hold hands through the warmth of mittens, brushing past frost-covered branches to reach a lookout point, spotting the snow-capped Lions in the distance. Come spring, cherry blossoms coat our shoes in pink confetti as the park blooms from brown to green for another season. Over 3,000 plants fill the beautifully landscaped Stanley Park Rose Garden. In the spring, it comes alive from above as well when the cherry blossoms pop. Between the roses, blossoms, and the 100 years-old tribute to William Shakespeare (a monument and tree) in the north end of the garden, it’s a lovely picnic area, backdrop for dreamy photos, and spot to read a sonnet or two. Most of Stanley Park’s trails are named for Park Board commissioners and city officials, but Lovers Walk, as far as I know and in my mind, is simply a romantic stroll. It’s also where you can find these two trees that appear to be embracing. Wedding photos, engagement photo, grad photos, family photos, Prospect Point has been a setting for them all. This lookout is fun to get to (on foot, through the trails) and easy to reach by car. The traffic on Lions Gate Bridge rumbles by as boats pass underneath and the sun lights up the north shore. Pick up an ice cream cone or stop in for a pint and stay a while (note the restaurant is currently closed until summer). Palm trees, a setting sun, and waves lapping at the sand set the scene for an evening at Third Beach. Watch the day settle into the horizon and hold your sweetheart close as the night’s first stars appear. Nestled atop Ferguson Point, between the ocean and the forest, The Teahouse has a gorgeous patio in the summer, a tea room, a drawing room, and the glass-topped conservatory where garden lights twinkle like stars as you enjoy an intimate dinner. 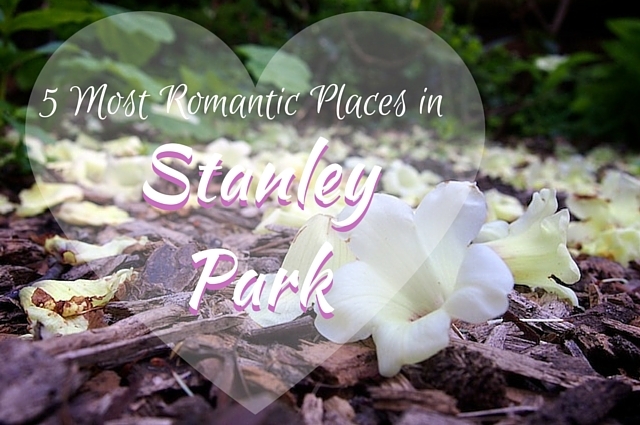 To learn more, check out the Stanley Park Ecology Society’s “Romantic Stanley Park: Its Amorous, Curious and Shady Sides” walk on Valentine’s Day. Tickets are available now for $10 (non-members) and $5 (SPES members).